In her new book, the nutrition expert lays bare the soda industry’s powerful and harmful tactics. 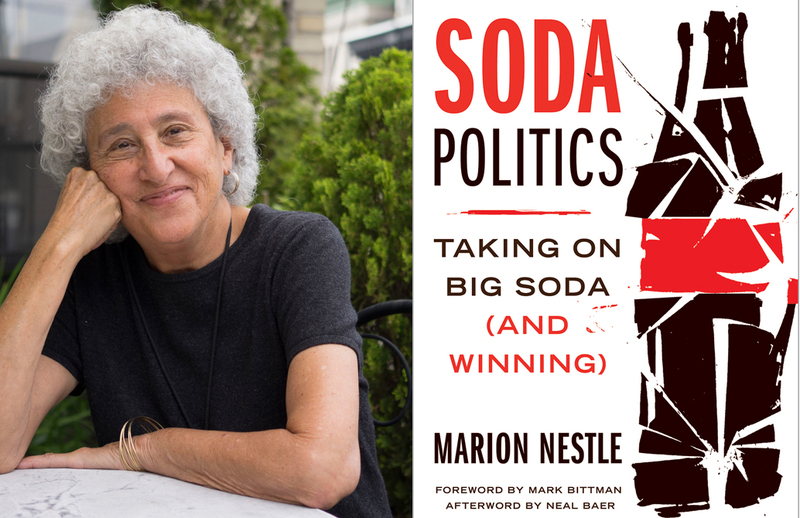 In her new book, Soda Politics, New York University nutrition professor and author Marion Nestle takes an in-depth look at the sociopolitical, economic, cultural, and public health forces shaping today’s soda industry. Nestle masterfully deconstructs the industry’s stratospheric rise to power as a global behemoth and gives a detailed account of the current era of increased scrutiny and amped-up soda lobbying. Nestle thoroughly expounds on the soda industry’s marketing and corporate social responsibility tactics. She also details the way it is increasing focus on the developing world, marketing to children, targeting people of color, recruiting public health leaders, making political campaign contributions, creating front groups, and strategically funding health organizations. No stone is left unturned. Many chapters end with a list of suggestions on how health advocates can work to do things like: get sodas out of schools, advocate for soda taxes, stop marketing to children, and exclude sodas from supplemental nutrition assistance program (SNAP) eligibility. I had a chance to correspond with Nestle recently about the book, some of the industry’s maneuvers, and the changing face of food advocacy. When your book Food Politics came out in 2002, the topic was far from mainstream. Now, Coca-Cola’s corporate strategies are on the front page of The New York Times. What does that tell you? The world has changed. When I wrote Food Politics, nobody was talking about the effects of food industry marketing on eating choices, especially those on kids, and nobody was writing about how food industry sponsorship influences the outcome of research. A lot has happened in 13 years, not least the food movement. Interest in food issues is now practically universal and much of the interest is focused on the economic, social, cultural, and political determinants of daily diets and what can be done to promote healthier and more sustainable eating. In Soda Politics, you write that Coca-Cola typically and deliberately owns no more than a 49 percent share of any franchise operation. Can you expand on the thought process behind that decision, and its ramifications? It’s a brilliant marketing strategy. The bottlers own the plants, have to buy all the equipment, and take the risk. The parent company sits back and collects the money. This strategy became evident when reporters and movie makers started looking into the murders of union organizers in soda-company bottling plants in Latin America. I don’t know whether the parent companies gave tacit consent to union busting, but they could say they didn’t own the plants and weren’t involved. The Brooklyn-based Campaign to Stop Killer Coke is devoted to holding soda companies responsible for what their bottlers do, and this topic is the subject of several books I discuss in an appendix to Soda Politics. Canadian filmmakers produced a documentary that is also worth seeing. Your book gives advocates countless suggestions on how to tackle a number of “soda politics” problems. How can food advocacy improve? Community organizing! If you want people to support your efforts to keep food corporations from undermining the food movement, you have to work with other groups to gain support. Berkeley passed a soda tax in part because its advocates put a lot of effort into community education—in every community, rich and poor. In my opinion, a major reason for the failure of [former New York City] Mayor Bloomberg’s 16-ounce soda cap idea was the total lack of community organizing. Then, when it did happen, it was way too late. The literature on social movements has many lessons to teach food advocates. You identify the reliance on celebrities as one of the seven basic principles of marketing sugary drinks. Do you think there will ever come a time when partnering with a soda company will be seen as a stain on a celebrity’s reputation? I think it’s only a matter of time. Soda sales are way down in the United States and people who are educated and relatively wealthy have cut way down on drinking them. The next step is to reach the groups most vulnerable to the harm caused by habitual soda drinking. Most advertising is targeted to them. It’s not an accident that so many of those sports and music figures who advertise Coke or Pepsi are members of minority groups. I discuss how minority leaders are increasingly concerned about the effects of sodas on their kids. The effort to discourage marketing sodas to minorities has to come from them—and it’s happening. When it comes to Big Soda targeting Latinos and African-Americans, you refer to two distinct eras: one before the recognition of obesity as an acute problem in those communities, and one after. How do these two eras differ? That was one of the big take-home lessons of my research. I live in New York and was surprised when major minority organizations supported the soda industry in its resistance to [Mayor Michael Bloomberg’s] soda size cap initiative. I learned that this support has a long history beginning in the early years of the Civil Rights movement, when African-Americans were pressing soda companies to hire them and to place advertisements in their publications. I didn’t realize that Martin Luther King, on the night before his assassination, urged his followers to boycott Coca-Cola over job discrimination issues. Since obesity has become more prevalent in that community, the situation has gotten more complicated. Soft drink companies produce winners and losers in minority communities. I’m seeing evidence that health issues are becoming more important. You write that Big Soda attacked health advocates as far back as the 1950s. These types of attacks, whether “softball” or “hardball,” continue today. What is the best way for advocates to respond, if at all? It’s critical for advocates to hold companies accountable for transparency, as has just happened with Coca-Cola. As a result of the scandal over the company’s funding of the Global Energy Balance Network’s dismissal of dietary intake as an important contributor to obesity, Coke agreed to release the names of all of the groups and individuals that it funds. It’s an impressive list, and its posting has embarrassed many of the funded organizations. Several groups—most notably the Academy of Nutrition and Dietetics and the American Academy of Pediatrics—have severed ties with Coca-Cola or vice versa (it’s interesting that both sides claim credit for the severance). In subtitle of your book, you imply that food advocates might be winning the battle against Big Soda. Can you say more? My point in the “and winning” subtitle is that food advocates are having profound effects. My personal marker is the rapidly expanding number of food studies programs. When we started food studies in 1996, we were about it. Now something like 80 universities have such programs. You may not think so, but as I see it, you, a graduate of NYU’s nutrition program, helped start Dietitians for Professional Integrity, a group that is having a major effect on dietitians’ views of food industry sponsorship. If nothing else, you’ve put the conversation on the table. Coca-Cola believes that obesity, meaning health advocacy, is the biggest threat to its profits. It is scrambling to figure out ways to make money on smaller portions and healthier drinks. Advocacy isn’t linear, but we won’t make progress without it. We have heard quite a bit about the soda industry’s “personal responsibility” mantra. However, you bring up another card the soda industry likes to play: the environment. Can you say more? One way to deflect attention from the harm that soda causes to health is to focus on environmental initiatives. Soda companies are doing everything they can to reduce the amount of plastic and water they use, and to fund recycling initiatives. These efforts are often so successful that the companies win environmental prizes for them. But recycling shifts the burden of cleaning up the environment to consumers while the companies lobby against bottle return bills and bans on plastic bottles in national parks. The companies can reduce the amount of water used to make the drinks, but can’t do much about the amount of water needed to grow sugar, which is enormous. I ended up thinking that these [soda] companies are schizophrenic. The people who work for them couldn’t be nicer and more concerned about health and the environment. But behind the scenes, the companies are just about selling product, pleasing stockholders, and making profits. That’s their job. And that’s why they lobby so fiercely against public health and environmental measures that would really make a difference.